Check your local television listings and set your DVRs. You won’t want to miss this. It was “lights, camera, action” as three camerados battled butterflies in their stomachs, all for the sake of explaining what can be done to fix our crippled criminal justice system. 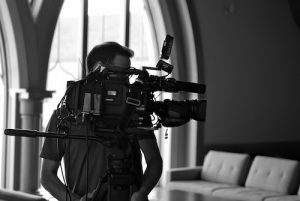 On 27 August 2014, CBS producer Liz Kineke and crew came to the University of Notre Dame to film interviews of Father Dave Link, Gary Sparkman, and me for an upcoming episode titled “Crime, Punishment, & Redemption” in the Religion & Culture series. The episode is scheduled to premier on Sunday, 5 October 2014 but you’ll have to check your local listings for the date and time when your CBS affiliate station will air the show. Thanks to the helpful intercession of vice president for university relations Lou Nanni, the regal third floor conference room of beautiful Stayer Hall was made available to us. 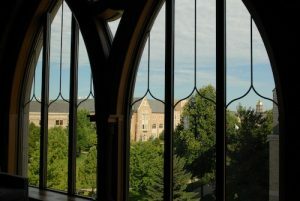 From a magnificent cathedral-shaped window, we could see the iconic Golden Dome gleaming in the sunshine. After introducing myself to Liz and her crew–assistant Natalie Baxter, cameraman Dan Morris, and sound technician Rich Pooler–I drove to Hammes Notre Dame Bookstore, where Gary would leave his car and come with me to the site of the filming. Gary, whose story is told in Chapter 12 of Camerado, I Give You My Hand and whose successful re-entry into society has been a miracle of sorts, had graciously agreed to be interviewed for the show. Gary’s face lit up when he saw me pull into the parking space beside him. We climbed from our cars and gave each other bear hugs. He looked fantastic. I felt a rush of pride. It had been one year since I had seen Gary on the night of the book release party for Camerado. Gary had been the first to arrive at the Eck Alumni Center, where the elegant celebration was held, so I had been able to spend time with him before the crush of guests arrived. I was excited to place a copy of Camerado in his hands, but I was unprepared for his deeply emotional reaction. “Wow,” he said, overcome. “Wow.” He sank into a nearby couch and sat there, too stunned to say anything else, as he turned the pages. He became oblivious, as if he had gone into some deeply private place and the rest of the world had disappeared. So here we were, one year later, happy to be together once again. As I drove to Stayer Hall, Gary and I talked about how much we admire Liz, who had proven in phone conversations just how well informed she is about prisons, and about poverty, and about the connection between the two. As we rode the elevator to the third floor, we talked about Gary’s daughter and her love of reading—my kind of kid, for sure. And then as we walked down the long corridor toward the conference room where the crew was customizing lighting conditions and setting up equipment, we talked about how nervous we were. Entering the room and turning to his left, Gary suddenly stopped in his tracks. There, right in front of him, sat Father Dave. I realized then that he had not known that Father Dave would also be here for the taping. Father Dave, who was by now on his feet, extended his hand as he closed the short distance between them. Gary took the outstretched hand and then simply wrapped his arms around the priest. As if they were long-lost relatives, the two figures melded into one. Great, I thought, furiously blinking back tears that would obliterate my camera-ready eye makeup. This is not the time to cry. I felt terrible as I watched Gary struggle to keep his composure. He was so emotional, so raw, it made me feel guilty, as if I were engaged in indoor rubber-necking. And yet, at the same time, I felt a keen awareness that Liz and the others were witnessing a powerful scene that could never have been scripted. It was the kind of thing I had seen over and over again the past four years since I had started writing my book. This is the kind of genuine exchange of emotion that happens all the time between Father Dave and his brothers. His camerados. I turned to look at Liz. She was gazing, mesmerized, at the two friends. Backlit by the brilliant August sunshine, an aura of light surrounded her form. Was I imagining it, or was she blinking away a few tears of her own? She caught my glance. Her mouth curved in a gentle smile, and she nodded. It was then that I knew this would be a great day. Lights. Camera. Action. Bring it. Bring it all. We were ready.